It’s not often you will hear people asking chiang Mai to follow in the footsteps of Bangkok, but if the BMA (Bangkok Metropolitan Administration) carry on doing what they are doing apropos footpaths and removal of objects, then Chiang Mai might learn a thing or two from Bangkok. It was reported in Thailand’s National News Bureau that within a week BMA have already got rid 3,118 unlicensed advertising banners on the sweltering walkways of the capital in order to free up space for pedestrians. BMA has said it wants to make Bangkok a walkable city, and make pathways all over the metropolis. Legal action will be taken against anyone seen as damaging public property, while anything blocking the way of pedestrians, including taxi ranks, will be freed up, said a BMA spokesperson. Let’s hope Chiang Mai city will do the same for us. At the moment waling from one side of Chiang Mai to the other, although it could be a pleasant walk, is virtually impossible due to extremely bad pathways and the arrogance of people who block the pathways – often for business purposes. 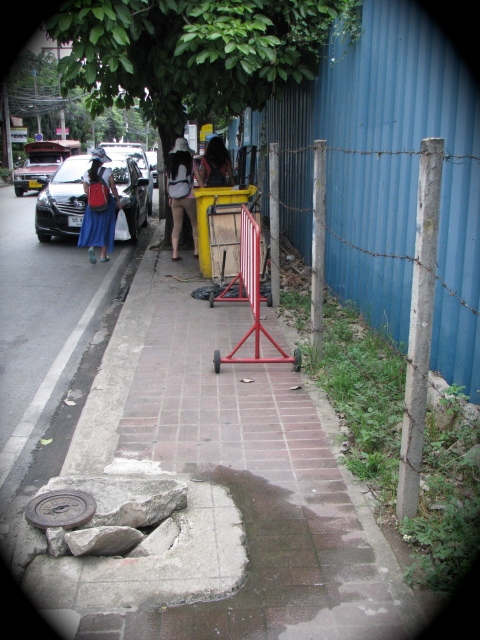 photo: An example of Chiang Mai’s world-class ‘handicap sidewalks’; i.e. if you walk on them long enough, you WILL BE handicapped!